None But My Own: How many tickets for the big head Han Solo? How many tickets for the big head Han Solo? PS space 1999 as well if you are old enough to remember what that was!! I used to joke to a friend of mine that every friend I ever had I met either through Star Wars or music. Dorky yeah, but it was true for 80% of my life, before kids that is. But the above message is from Mastodon Guitarist and resident Star Wars collector (geek) Bill Kelliher. 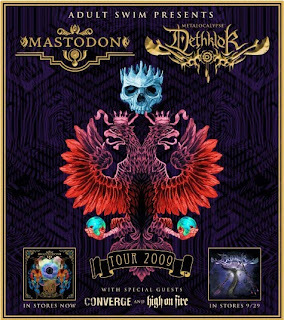 Mastodon are about to kick off a tour with Dethklok (not sure I get it) and the mighty, mighty High On Fire. So if you're into space, cartoons and the heaviest trio since Celtic Head or Motor Frost, can't remember which, go see a show and support High On Fire. Here's hoping they continue to "road test" new material live so if you go chances are you'll be treated to a new song or two. Alice In Chains, 9.20.09 Milwaukee, WI.